We're suckers for one-of-a-kind jewelry. Especially when it doesn't cost a billion dollars. Hence why we quickly found a sweet spot for the gorgeous handmade gemstone pieces by Colorado-based Margery Hirschey, all of which are created exclusively from 100% recycled 18- and 22-karat gold and silver. This lovely lady has a knack for putting together perfect color combinations and slightly off-kilter shapes to create a collection that feels very special. Like it was made just for you. Clearly other people agree, as she received the 17th Annual Fashion Group International Rising Star Award for Fine Jewelry in 2014. (OK, fine, we guess the secret is out.) This is jewelry for the girl who takes the road less traveled – just how we like it. Perfectly Bohemian/luxe earrings featuring 22k/ss with tourmaline, opal and apatite. Ring in 22k gold with boulder opal, $3,740. A shot of the diamonds she's currently lusting after. Us, too, Margery. Us, too. Pendant in 18k gold with a 27.09 ct. kunzite and baroque freshwater pearl, $7,920. Color for days. We love these 22k earrings with rhodolite garnet and labradorite, $4,620. Give us this ring in 22k gold with an 8.25 ct. emerald, $6,700. Just give it to us. Emeralds all day yes please. 22K earrings with 9.08 cts emerald and baroque freshwater pearl, $6,655. Loving the shape of this 22k gold ring with rutilated topaz, $3,720. Margery's favorite pair she's made this year: in 22K gold featuring Boulder opal, moonstone and rose cut diamonds. 22k necklace with Boulder opal, turquoise and diamond, $6,580. 22k earrings with kunzite, $3,575. 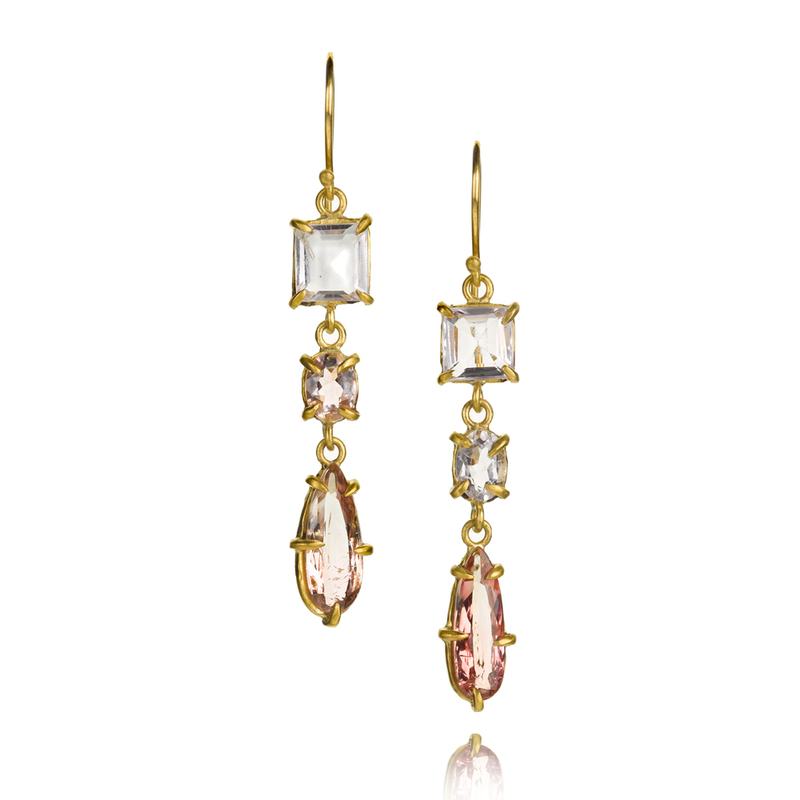 22k gold earrings with tourmaline, morganite and kunzite, $2,765. Many years ago I studied, briefly, with a couturier by the name of Charles Kleibacher. He was giving an intensive workshop at a local university. Because I was tall and thin, he had me model all the clothes he brought. It’s one thing to admire a garment on another person or on a hangar, it’s a completely different experience to try on and wear a garment that is truly made to move with, and be worn on, a woman’s body. I’m talking haute couture – sewed almost exclusively by hand and made for a specific woman – has to be the ultimate luxury. My favorite local restaurant is called Pizzeria Locale...unfortunately it’s not my husband’s favorite restaurant so I don’t get to go as much as I would like to, not meat and potatoes enough for him, I guess. It’s a “contemporary pizzeria inspired by the traditional pizzerias of Naples, Italy. Let’s see...we’d start with their tomato, basil and mozzarella di bufala and then, perhaps, some arancini and one of their delicious thin crust pizzas. My favorite is the Mais: mozzarella, sweet corn, proscuitto, cotto-creme fraiche, garlic and chives. My friend calls it the “butter pizza” and it is to die for. There was a little ring encrusted by tiny diamonds by JAR that looked like a twig covered in snow that is simply magnificent. If I could buy any piece of jewelry, that would be it. Ha! I haven’t been on a first date in a very long time but if I could orchestrate the Perfect first date...it would of course be with a very tall, handsome, intelligent man with a great sense of humor and an appreciation of women. If the person you were sharing the date was amazing, would it really matter what else you were doing?? I don’t go to a lot of movies but I think the last one I saw that I liked was Woman in Gold with Helen Mirren. A beautiful multi-carat, organically-shaped rose cut diamond...it will be mine someday. I think my favorite holiday is Thanksgiving, because you just have a great meal with family and friends and there are no expectations, just good food and great conversation. It is also the only time of year I cook for a huge dinner for company. A pair of earrings with the most beautifully colored boulder opals, moonstones and rose cut diamonds. They are just the right length of long...not too long but they definitely make a statement and can be worn with jeans or for evening. I hate selling pieces I really love, but alas, I know I will always make something I love more at some point. 30 minutes...hit and kick a heavy bag...best workout around and great for stress relief. A little antique ring I bought with my birthday money when I was about 13 years old or so which one of my daughters has confiscated. I would have to say Henri Mattise because I love his sensibility and he has been my favorite for as long as I can remember. I have the two diamonds from each of my grandmothers’ engagement rings. Both are old European cut and I have made them into simple solitaires. I love the idea of handing jewelry down through the generations. It is one of the few things you can hand down that will last forever. Probably city...I live in Colorado and the mountains are beautiful as is the ocean, but I love the culture and variety you only get in a city. I’m not sure I could live in a big city full time, but I’d like to try. Hozier, Michael Franti, Nathaniel Rateliff and the Night Sweats, Amy Winehouse, Stevie Wonder. I don’t cook...seriously, I don’t cook. It would be a giant Henry Beguelin tote. I have always lusted over these bags, one day I’ll splurge. It would be Zero Maria Cornejo, currently my favorite designer. I love everything she designs. I have really thick, curly, wavy hair and Bumble and Bumble Curl Conscious products changed my life.